Education and culture are important parameters of the quality of life of population in particular areas. To some extent, they characterize the standard of life and “spiritual environment”. The main source of information for creating these maps included official statistical data for 2012 (in some cases for 2011). Materials of the Russian Federal State Statistics Service and Mongolian statistical yearbooks were also used in this work. Cultural establishments are keepers and successors of the historical and cultural memory of the people, as well as mediators in its transfer to the next generations. Usually, cultural establishments include libraries, museums, theaters, clubs, cultural centers, cinemas, leisure centers, and cultural complexes. In the Baikal basin, there are about 1,770 cultural establishments. The total number of cultural-and-leisure centers in this region is 875. There are 720 libraries, 106 museums, 30 theaters, 36 cinemas, and 4 circuses. In the Russian part of the basin, there are 247 children’s music, art, and dance schools. Each administrative district has cultural-and-leisure centers (clubs) and libraries. Most of the districts also have museums. Cultural life is most vividly represented in the major cities of Ulaanbaatar, Irkutsk, Chita, and Ulan-Ude. There are famous theaters, museums, circuses, large libraries, and cinemas. Museums serve as the main tool of memory materialization. Often, they focus on local history and ethnography. Museums give tourists information emphasizing the originality and specificity of a particular place, its nature, history, and culture. 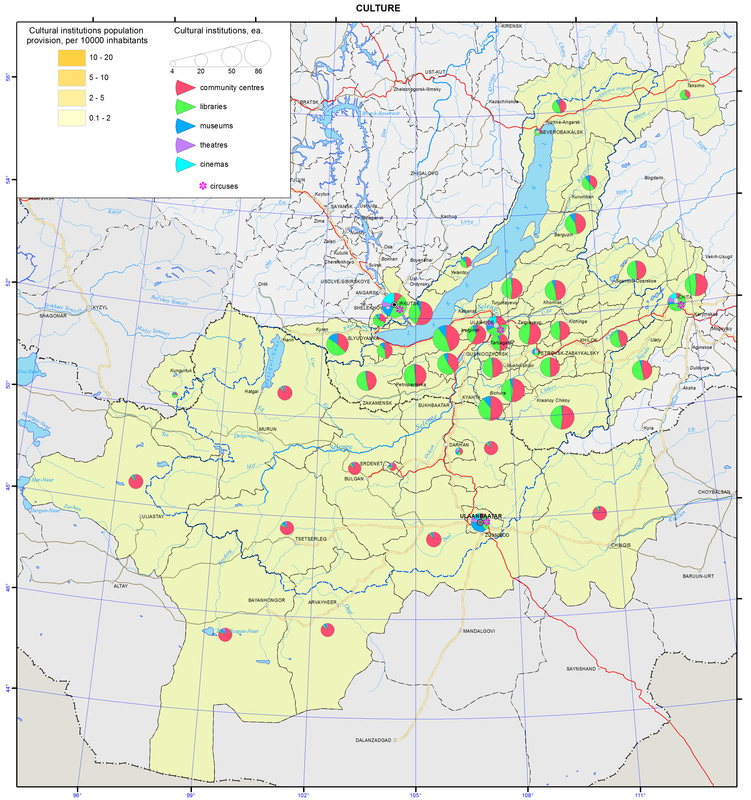 Thematically, museums of regional centers (Ulaanbaatar, Irkutsk, Ulan-Ude, and Chita) are quite diverse. In the Irkutsk part of the basin, the most valuable collections are kept at the oldest museums, such as the V. P. Sukachev Museum of Art, Irkutsk Museum of Regional Studies, Taltsy Museum of Wooden Architecture and Ethnography, Historical and Memorial Museum of Decembrists, and Baikal Museum of the Irkutsk Scientific Center SB RAS in Listvyanka. Among the largest museums in the Republic of Buryatia are the Sampilov Museum of Fine Arts, Museum of Natural History of Buryatia, and Ethnographic Museum (all in Ulan-Ude), as well as the Kyakhta Museum of Regional Studies. The prevailing type of museums in Zabaikalsky krai are historical museums of regional studies illustrating the rich history of the region’s development and the life of Decembrists and other exiles. The State Central Museum of Mongolia holds a comprehensive and unique collection of artifacts offering an opportunity to learn about the country’s natural history. Theatrical life in the region is represented by a number of establishments. There are the Okhlopkov Academic Drama Theatre, Zagursky Musical Theatre, Puppet Theatre “Aistenok”, Vampilov Youth Theatre, and Children’s Circus in Irkutsk. In the Republic of Buryatia, there are the Buryat State Academic Opera and Ballet Theatre, steeped in tradition Khotsa Namsaraev Buryat State Academic Drama Theatre, and Nikolay Bestuzhev State Russian Drama Theatre, which is the oldest theatre company in the Republic. In Buryatia, there are also avant-garde theaters, namely, the Ulan-Ude Youth Theatre-Studio and Theatre-Studio of Modern Body Movement and Pantomime “AzArt”. There are also Buryat State Philharmonic, song and dance ensemble “Baikal”, state theatre of folk dance “Badma-Seseg”, and Puppet Theatre “Uliger”. In Chita, there are the Zabaikalsky Regional Drama Theatre and Zabaikalsky Puppet Theater “Tridevyatoe Tsarstvo” (“Far Away Kingdom”). Famous Mongolian theatres include the State Academic Opera and Ballet Theatre and Mongolian State Drama Theater (D. Natsagdorzh State Drama Theatre). The Mongolian circus has existed for more than 60 years and is the “Brand of Mongolia”. It has a circus school. Libraries collect books and other publications and specifically process them. They also promote and organize mass campaigns with readers. Libraries have different specializations and subject matters. There are libraries of the Ministry of Culture, schools, universities and colleges, departmental libraries, and so on. In Irkutsk, there is the I. I. Molchanov-Sibirsky Irkutsk State Universal Scientific Library, which has been serving readers of the Angara region since 1861. In Ulan-Ude, there is the National Library of Buryatia, which is a modern informational institution. In Chita, there is the A. S. Pushkin Zabaikalsky Regional Universal Scientific Library. In Ulaanbaatar, there is the State Public Library of Mongolia. Its collections include the smallest Buddhist sutra in the country “The Story of the Green Tara”. Cinemas are designed to entertain the population. Modern cinemas also perform different forms of leisure functions. In Irkutsk, Ulaanbaatar, Ulan-Ude, and Chita, there are 15, 6, 5, and 4 cinemas, respectively.